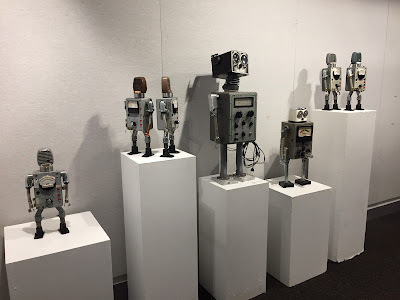 Welcome to: The Robotorium: The Reclaimed Opening was Great! The Reclaimed Opening was Great! Last night was the opening of the Reclaimed Exhibition a the Mosesian Center in Watertown, MA. It was a blast. Hats off to Roberta, Kimberly, Matt and all the other people at the center for doing a great job with the show. I was very happy with the feedback I got, people loved the robots! There were lots of comments on how each one has a clear personality and how much they make people smile, which is exactly what I am going for. Here is the display of my work. Having never done anything like this I was not sure what to expect, but it was such fun. It was also cool to be able to talk to other artist and get feedback from them. Overall the whole evening was very energizing.